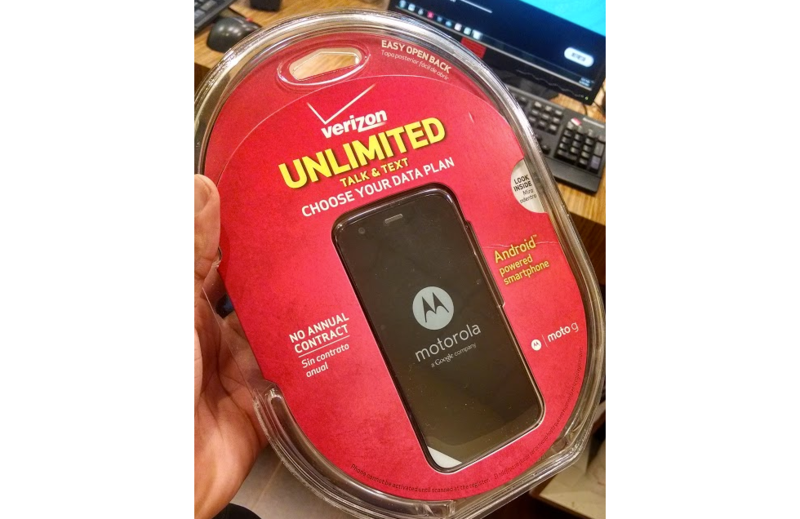 We have known that Verizon plans to bring the Moto G to its network sometime in Q1 of 2014 since November, but this afternoon, we are seeing that this device is turning into something much more than just a cheapy pre-paid phone. It’s actually not that bad – priced at $179, it features suitable specs for anyone who looks to score a phone off contract that won’t either a) snap in half due to cheap materials or b) suffer from poorly-made software and other issues. Either way, as a few folks are finding out, the Moto G is a great phone for the price. Thanks to a new leak, the device has been spotted in apparent Verizon retail packaging. According to the leaker, the device might even come with an outrageously low price tag of just $100. Seriously, just a $100. That info is nowhere near confirmed, but if they happen to have their hands on the retail packaging already, then it’s quite possible that they know Verizon’s future plans of marketing the device for an insane price. Regardless, if the Moto G is launched on Verizon for just $99, Moto and Verizon might see crazy sales taking place. Would you pick one up for $100?